Doctors and patients did double-takes when the equine visitors ambled down corridors in the pediatric unit at Chicago's Rush University Medical Center. Wide-eyed youngsters hooked up to IV poles stepped into hallways to get a glimpse. Kids too sick to leave their rooms beamed with delight when the little long-lashed horses showed up for some bedside nuzzling. Mystery and Lunar are as small as big dogs. They are equines on a medical mission. They offer comfort care and distraction therapy for ailing patients. It is a role often taken on by dogs in health care settings. Animal therapy, according to studies and anecdotal reports, may benefit health. It might even speed healing and recovery. These horses and two others belong to the animal-assisted therapy group Mane in Heaven. It's based in Lake in the Hills, a suburb northwest of Chicago. The horses have visited nursing homes and centers for the disabled. This was their first-ever inside a hospital. It was also the first horse-therapy visit for Rush, and more are planned. "We have ... seen the enormous benefits that animals can have on most children, just the joy that they bring, the unconditional love," said Robyn Hart. She is the hospital's director of child life services. Some people confuse these horses with better-known Shetland ponies. Minis are less stout, with a more horse-like build. The therapy they offer contrasts starkly with the hospital environment. They bring soft ears to scratch, fluffy manes to caress, big soulful eyes to stare into. Some research has suggested that animal-assisted therapy may reduce pain and blood pressure. It also may decrease fear and stress in hospitalized children. But much of it is based on patients' reports. A review of 10 years of studies about in-patient therapy using dogs, published in April in the Southern Medical Association's journal, concluded that it's safe and can be effective. Dr. Caroline Burton of Mayo Clinic in Jacksonville, Florida, was a co-author of the review. She owns seven dogs, four regular horses and a donkey. She strongly supports animal-assisted therapy. Burton acknowledged that skeptics dismiss it as "touchy-feely." She said studies are needed on whether animals in hospitals can shorten patients' stays. Some worry about animals bringing germs into hospitals. Burton's review found no associated infections in patients. Siegel, Mane in Heaven's owner, and her horse helpers carry lots of hand sanitizer and a pooper scooper on therapy visits. Siegel doesn't feed the horses beforehand to help avoid accidents. Even so, one of the horses pooped in a hallway during the Chicago hospital visit. But the volunteers cleaned it up in a flash. I thought that was sweet because they are putting smiles on they're faces.Also how they made the kids laugh they made me laugh too and it was cute.And it was cute by these horses. Jodie Siegel uses mini horses because for one, most people have never seen a mini horse in person, and two, if they used a normal sized horse, they probably wouldn't be able to fit it in the rooms of the patients. Jodie calls them mini horses because they are not the same size as full grown horses. They are small and adorable. They look like Pony's. They don't really look like full size horses since they are so small so you would call them mini horses. Jodie Siegel uses mini horses instead of full-size horses because the full size horses might make louder nose than the mini horses and also the full size horses might frighten the children at the hospital. Mini-horses add an extra element of delight. Many kids don't know they exist outside of fairy tales They give comfort care and distraction therapy for ailing patients. 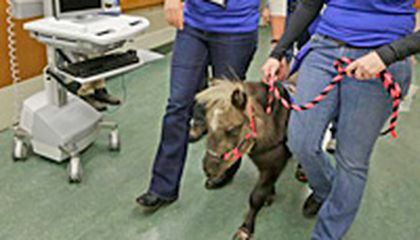 I just read about a company called ''Mane in Heaven'' bringing mini horses into hospitals to cheer up patients. The patients love them. It is so sweet of the company to do that. I think Jodie brought mini horses instead of full-size horses because it would be more safe. It also said in the article that she brought mini horses because it brings more delight. 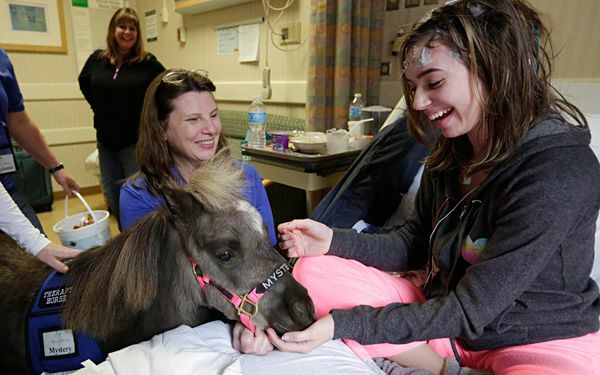 I think its really nice for Jodie to bring mini horses in the hospital to make patients more happy. I enjoyed reading this article very much. I think she uses mini horses because big horses wouldn't fit into a little corridor also because big horses cause more havoc than mini horses. I think that it's wonderful that they have people come and bring animals to relive stress and heal them faster. Some of the states have a room full of puppies in colleges so when they are stressed out they can go play with the puppies. But now they bring the animals to hospitals and retirement homes, I myself think that's outstanding! It's very interesting how animals can help healing and maybe can benefit health. Well, I think that the mini horses are better, because they can fit into small, skinny doors. They are also cute (maybe you don't think so, but I do). The horses would be too big to get in the doorway of the hospital, and hard to get to the hospital beds. Maybe if they could push them in, they still wouldn't fit into the doorways to the bed and patients. So, that's why I think mini horses are better for the hospital. I have never heard of mini horses. They seem really cool and I would love to see one. I think it's sweet that they bring pets into hospitals to help children get better. I would really like that since I don't have a pet. If I was sick and in the hospital, I would want to see a horse or dog to cheer me up. I understand why they use mini horses instead of full grown ones. Full grown horses might be to big to fit in the hospital doors. Or if they freak out they could bump over all the medical equipment and might hurt the patient; even more than he or she already are, which is why I think it's smart that they use mini horses.